468 pages | 57 B/W Illus. As the Earth`s surface deviates from its spherical shape by less than 0.4 percent of its radius and today’s satellite missions collect their gravitational and magnetic data on nearly spherical orbits, sphere-oriented mathematical methods and tools play important roles in studying the Earth’s gravitational and magnetic field. 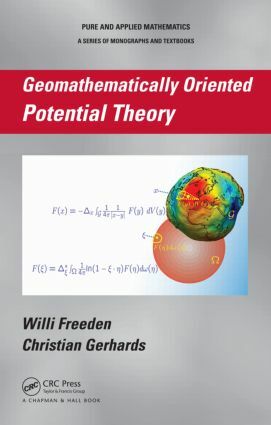 Geomathematically Oriented Potential Theory presents the principles of space and surface potential theory involving Euclidean and spherical concepts. The authors offer new insight on how to mathematically handle gravitation and geomagnetism for the relevant observables and how to solve the resulting potential problems in a systematic, mathematically rigorous framework. The book begins with notational material and the necessary mathematical background. The authors then build the foundation of potential theory in three-dimensional Euclidean space and its application to gravitation and geomagnetism. They also discuss surface potential theory on the unit sphere along with corresponding applications. Focusing on the state of the art, this book breaks new geomathematical grounds in gravitation and geomagnetism. It explores modern sphere-oriented potential theoretic methods as well as classical space potential theory. Willi Freeden is a professor in the Geomathematics Group at the University of Kaiserslautern. Dr. Freeden is an editorial board member of seven international journals and was previously the editor-in-chief of the International Journal on Geomathematics. His research interests include special functions of mathematical (geo)physics, PDEs, constructive approximation, integral transforms, numerical methods, the use of mathematics in industry, and inverse problems in geophysics, geodesy, and satellite technology. Christian Gerhards is a visiting postdoc researcher in the Department of Mathematics and Statistics at the University of New South Wales.